M. Ulpius Trajanus, was born at italica, near Seville, the 18th of September, 52. He was consul in 91, and at the close of 97 he was adopted by the Emperor Nerva, who gave him the rank of Caesar. He was the first emperor who was born out of Italy. Nerva died in January, 98, and was succeeded by Trajan. Obverse: DIVO TRAIANO PARTH AVG PATRI, laureate, draped, and cuirassed bust right. 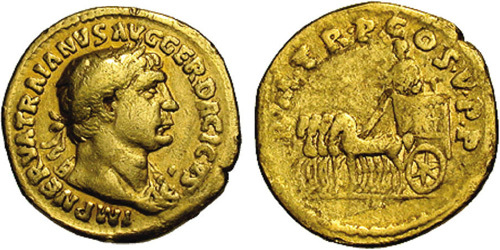 Reverse: TRIVMPHVS PARTHICVS, Trajan standing right in slow, triumphal quadriga, holding eagle-tipped scepter in left hand and branch in right; on side of car, a figure of Securitas standing facing, legs crossed, resting arm on column. Reverse: No legend, Phoenix radiate, standing, right. Reverse: No legend, Phoenix radiate, standing on laurel-branch, right. Reverse: PLOTINAE AVG, Draped bust of Plotina to right, her hair arranged in a high, double stephane at the front and with a long queue down the back. Obverse: DIVO TRAIANO AVGVSTI PATRI, Bare-headed and draped bust of Trajan right; behind, star. Reverse: DIVAE PLOTINAE AVGVSTI MATRI, Draped bust of Plotina left, wearing double metallic stephane; before, star. Obverse: IMP CAES NERVA TRAIAN AVG GERM, laureate head right. Reverse: P M TR P COS II P P, Fortuna standing left, holding rudder on prow and cornucopiae. Reverse: P M TR P COS II P P, Germania seated left, on shields, holding olive-branch. Reverse: PONT MAX TR POT COS II, Fortuna standing left, holding rudder with her right hand and cornucopiae with her left, at her feet to left, prow of galley. Reverse: PONT MAX TR POT COS II, Germania seated left on oblong shields, holding olive-branch in right hand, left arm resting on shields; below shields, helmet. 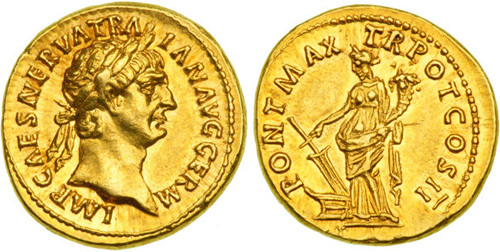 Reverse: PONT MAX TR POT COS II, Roma seated left on pile of arms holding victory and parazonium. Reverse: P M TR P COS III P P, Fortuna standing left, holding rudder set on prow and cornucopiae. Reverse: P M TR P COS III P P, Germania seated to left, leaning left elbow on shields and arms and holding olive branch in right hand. Reverse: P M TR P COS III P P, Roma seated left on cuirass, holding Victory and parazonium. Obverse: IMP CAES NERVA TRAIAN AVG GERM, Laureate head right, wearing aegis. Reverse: P M TR P COS IIII P P, Hercules standing facing on altar, holding club and lion skin. 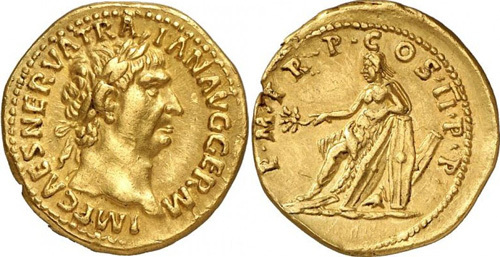 Obverse: IMP NERVA TRAIANVS AVG GER DACICVS, laureate head right, wearing aegis. 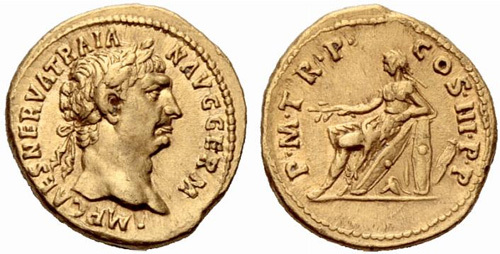 Reverse: P M TR P COS V P P, Emperor in slow quadriga left, holding branch and sceptre. Obverse: IMP TRAIANO AVG GER DAC P M TR P, laureate, draped, and cuirassed bust right. 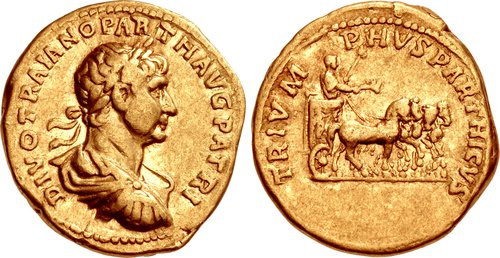 Reverse: COS V P P S P Q R OPTIMO PRINC ALIM ITAL, Trajan, togate, standing left, holding roll in left hand, extending right hand towards boy and girl to left, who stand right, the boy extends left hand up towards Trajan, the girl stretches both hands. Obverse: IMP TRAIANO AVG GER DAC P M TR P, laureate draped and cuirassed bust right. Reverse: COS V P P S P Q R OPTIMO PRINC, Ceres standing left with two ears of corn and torch.